How Does Non-Paid Media Impact the Effectiveness of Paid Ads? This blog post is a summary of a paper written by Angela Jeffrey, APR, Vice President Brand Management for ABX; Gary Getto, President of ABX; and Sandra Duhé, Ph.D., MBA, APR, Fellow PRSA, Associate Professor and Chair, Corporate Communication and Public Affairs Southern Methodist University. Download the full paper (PDF): How Does Non-Paid Media Impact the Effectiveness of Paid Ads? For the writers of this new IPR paper, studying the impact of earned media on advertising effectiveness started many years ago. Anecdotal studies suggested PR had far more power to affect advertising success than was generally believed. Thus, having the chance to formally test the concept with firms as prestigious as AT&T and Hotels.com has been a great opportunity. During the Literature Review for this paper, researchers found some 25 studies already in existence addressing the effectiveness of PR and advertising. However, none of these studies tested the impact of earned media vs. paid in real-life testing environments. ABX, a global advertising research firm with testing norms on 150,000 ads, examined this environment in a new study. As initially believed, earned media appears to impact advertising effectiveness, where the largest marketing investments are allocated. 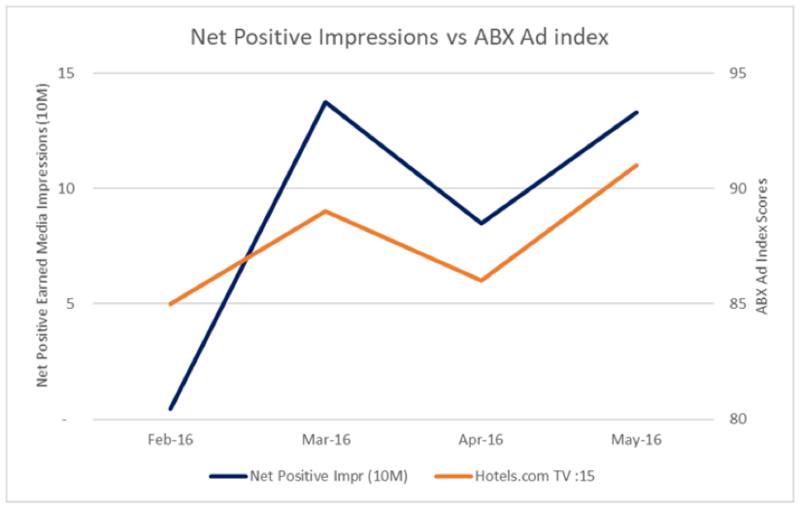 The second chart is from Hotels.com and shows how positive media coverage can help drive a higher advertising score. The ad that was measured, “Captain Obvious Runs for President,” was supported by PR campaigns, which likely helped drive the creative score from an ABX Index of 85 to 91, which met a +/- 95% Level of Confidence. Correlations between the PR and the ad scores were r=.86. PR teams should pursue relationships with advertising and agree on a testing method. PR management should cultivate relationships with advertising staff to integrate their efforts AND to measure results. As mentioned above, Hotels.com actively publicized the Captain Obvious advertising campaign and supplied Net Positive Impressions for the PR side of the equation. What PR needs from Advertising is the chance to have a big-dollar ad measured by the company’s copy testing firm both BEFORE and AFTER the PR campaign. 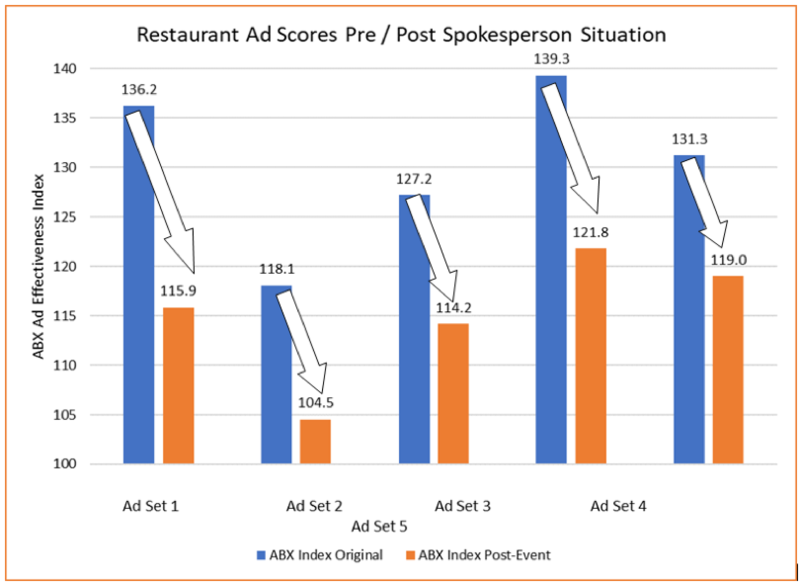 Then, if the ad creative scores change, the PR campaign can likely take credit. (The Ad Report below is a good example of what a copy test looks like). For clear results, keep your studies small and focused. The Hotels.com study provided only 109 Key Media clips over the 9-month period, which were very focused. The AT&T study, by contrast, provided 31,976 clips on all relevant topics. 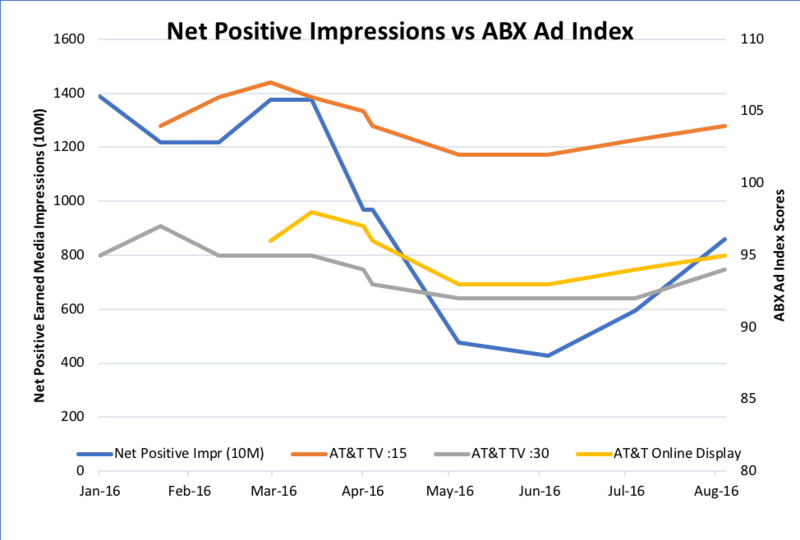 For AT&T, three ads were measured each month and correlations between Net Positive Impressions and the ABX Ad Index overall were very high at r=.93 to .97. However, the scores themselves didn’t change enough over time to show any real PR impact. Researchers should have limited the clips to demographically- or campaign-focused subsets to have a greater chance to see PR impact advertising scores. 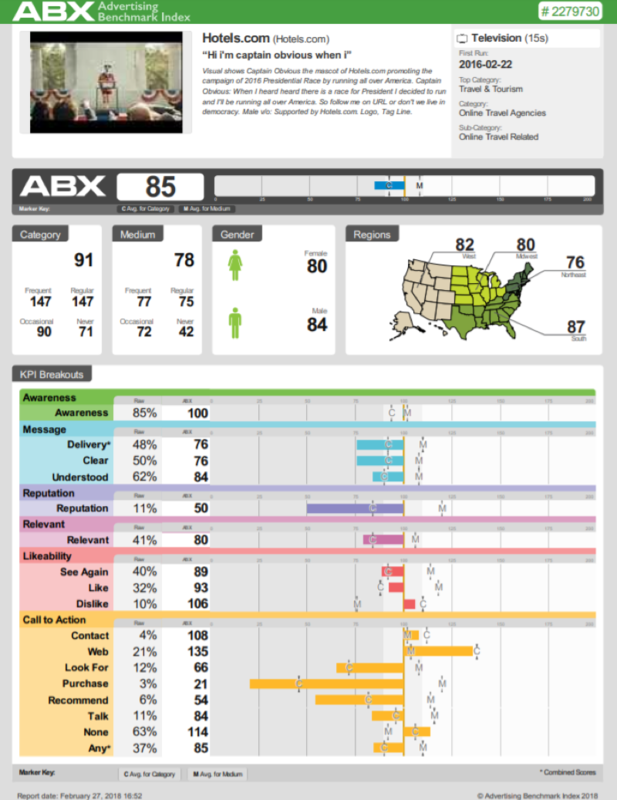 A TV spot receives an ABX Index score of 100 (Average). The TV spot had a $2 million ad buy against it and should deliver results commensurate. Now, the $2 million ad buy delivers an extra $400,000-worth of business outcomes, thanks to PR. Read the Literature! The Literature Review for this study yielded incredible experimental studies and papers on how PR and advertising work together. For instance, one study found that negative news followed by corporate image ads have a worse effect than running the corporate image ads before the negative news hits. (Pashupati, Arpan & Nikolaev, 2002). The paper provides citations of extremely important work from both PR and Advertising scholars. Is there a threshold that earned media must attain to see a noticeable impact on paid media? Is this effect consistent across industries? Is this effect consistent across media types? If you are interested in participating, contact Angela Jeffrey, angie@adbenchmark.com. 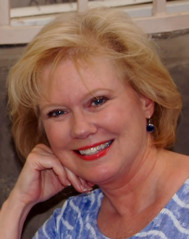 Angela Jeffrey, APR, is a national award-winning PR practitioner and long-time PR measurement expert. She is a member of the Institute for Public Relations Measurement Commission, for which she’s authored six papers on linking outputs to outcomes, social media measurement and international media analysis.